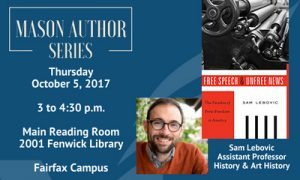 Join the University Libraries for our next Mason Author Series event, featuring a discussion with Sam Lebovic, Assistant Professor of History, about his recent book, Free Speech and Unfree News: The Paradox of Press Freedom in America. The reading and discussion will take place at 3pm on Thursday, October 5 in the Fenwick Library’s Main Reading Room (Room 2001). About Free Speech and Unfree News: Does America have a free press? Many who answer yes appeal to First Amendment protections that shield the press from government censorship. But in this comprehensive history of American press freedom as it has existed in theory, law, and practice, Sam Lebovic shows that, on its own, the right of free speech has been insufficient to guarantee a free press. Lebovic recovers a vision of press freedom, prevalent in the mid-twentieth century, based on the idea of unfettered public access to accurate information. This “right to the news” responded to persistent worries about the quality and diversity of the information circulating in the nation’s news. Yet as the meaning of press freedom was contested in various arenas—Supreme Court cases on government censorship, efforts to regulate the corporate newspaper industry, the drafting of state secrecy and freedom of information laws, the unionization of journalists, and the rise of the New Journalism—Americans chose to define freedom of the press as nothing more than the right to publish without government censorship. The idea of a public right to all the news and information was abandoned, and is today largely forgotten. Free Speech and Unfree News compels us to reexamine assumptions about what freedom of the press means in a democratic society—and helps us make better sense of the crises that beset the press in an age of aggressive corporate consolidation in media industries, an increasingly secretive national security state, and the daily newspaper’s continued decline. About the Author: Sam Lebovic is Assistant Professor of History at George Mason University, where he directs the PhD program in History and serves as associate editor of the Journal of Social History. He is the author of Free Speech and Unfree News: The Paradox of Press Freedom in America (Harvard, 2016), which was awarded the 2017 Ellis W. Hawley Prize by the Organization of American Historians, and was a finalist for the 2016 Frank Luther Mott award. His research focuses on the history of American politics, culture, and media, and has been supported by fellowships from the American Society for Legal History, the NYU Center for the Cold War and the US, the Center for Cultural Analysis at Rutgers, the Truman Library Institute, and the Woodrow Wilson National Fellowship Foundation. Lebovic’s essays and articles have been published in Diplomatic History, the Journal of Social History, the Journal of American Studies, the Columbia Journalism Review, the Los Angeles Review of Books, the Boston Globe, Politico, and other journals and edited volumes. He teaches courses on a wide range of subjects in modern American and global history, and is currently researching the mid-century history of cultural globalization. About the Mason Author Series: The University Libraries’ Mason Author Series features Mason faculty and alumni authors throughout the year, and is generously sponsored by the University Bookstore. For more information about the Mason Author Series, please contact John Warren, Head, Mason Publishing, jwarre13@gmu.edu, or Jessica Clark, Development & Communications Officer, jclarkw@gmu.edu. This entry was posted in FYI, Graduate Students, Mason Author Series, Mason Faculty/Staff, News, Speaker/Author, Special Event, Undergraduate Students by Jessica Clark. Bookmark the permalink.